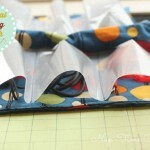 Today’s tutorial is a guest post from Katie at Running with a Glue Gun Studio. 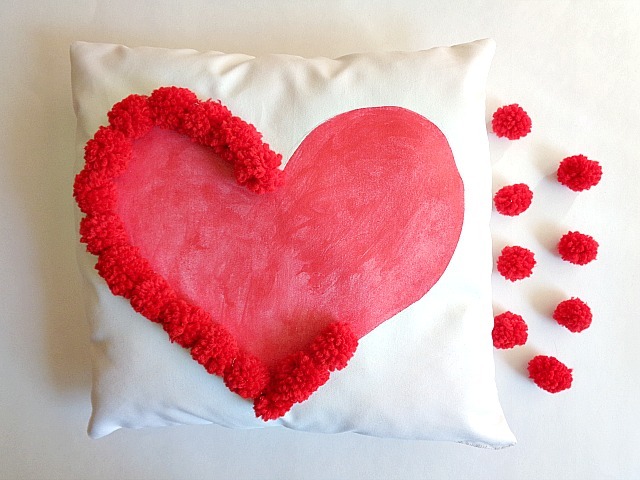 She’ll be showing us how to create this adorable pom-pom pillow just in time for Valentine’s Day! This project calls for a pom-pom maker, but if you’ve never made a pom-pom before you can check out this tutorial to learn how. Can you believe that Valentine’s Day is right around the corner? Well, if you’re looking to spice up your home decor for the holidays, then I have the perfect DIY for you! 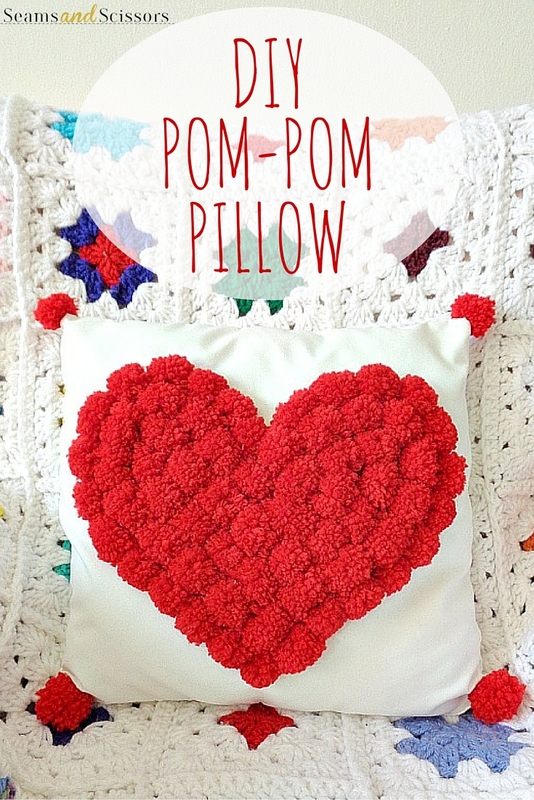 Today’s I’m going to be showing you how to create a really simple pom-pom heart pillow! Now if you never made a pillow before, that is ok! 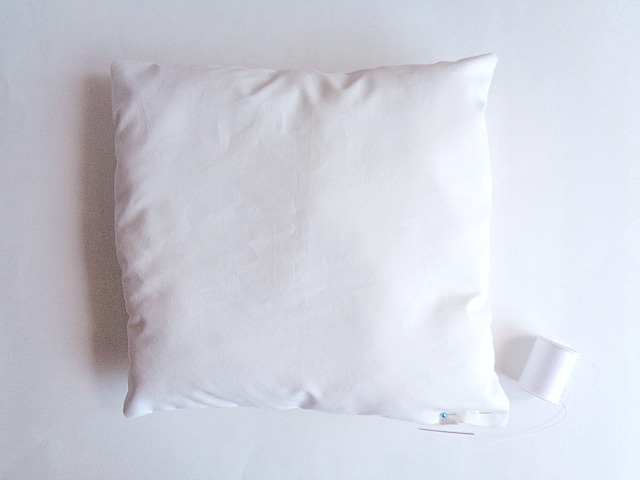 I will show you how to create a basic pillow in this tutorial, that you could either sew by hand or on the sewing machine. I promise you, it’s super easy! From there, we will make a bunch pom-poms to create our heart. For this project, I went with a traditional red heart, but you could make your heart in any color that you like! 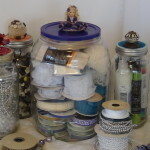 To do this, simply change the color of the yarn that you are using. 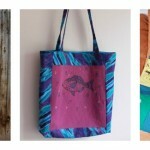 The project itself can be made over the weekend and is great for both beginning and novice sewers! If you’re going pom-pom crazy and want to find out how to make your own pom-pom heart pillow, then check out the full tutorial below! 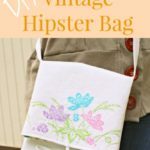 For this project I opted to sew everything by hand, but you don’t have to. 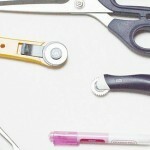 If you feel more comfortable using your sewing machine by all means sew away. Also, I ironed and measured out my fabric before I began making my pillow. The size of my pillow ended up being 12 inches by 12 inches. If you want to make your pillow smaller or bigger, you can adjust the measurements and use this DIY as a guide when sewing. 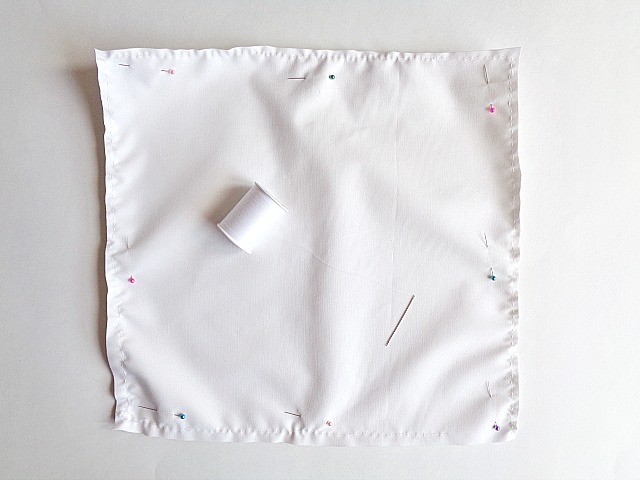 Step 1: Layout your white fabric (with right sides together) and sew around all four sides. However, when you get to the fourth side, leave a small opening so you can turn your pillow right side out. Step 2: Turn your pillow right side out and begin filling it with stuffing. 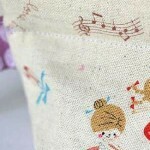 Once you’re happy with how your pillow looks, sew the small opening that we made shut. 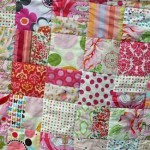 To do this, just fold down the edges and sew a simple stitch. 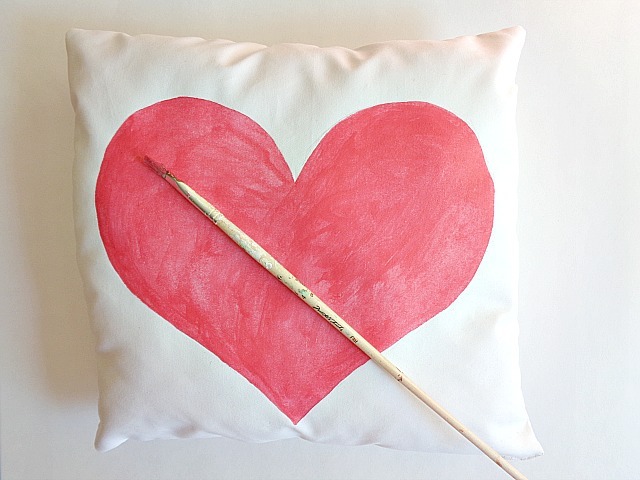 Step 3: Grab your pencil and draw a large heart shape onto your pillow. Then paint your heart with your red fabric paint. Once you’re happy with how it looks, set your pillow aside to dry. If you’re wondering why we’re painting our heart, it’s so that everything looks the same once the pom-poms are glued on. 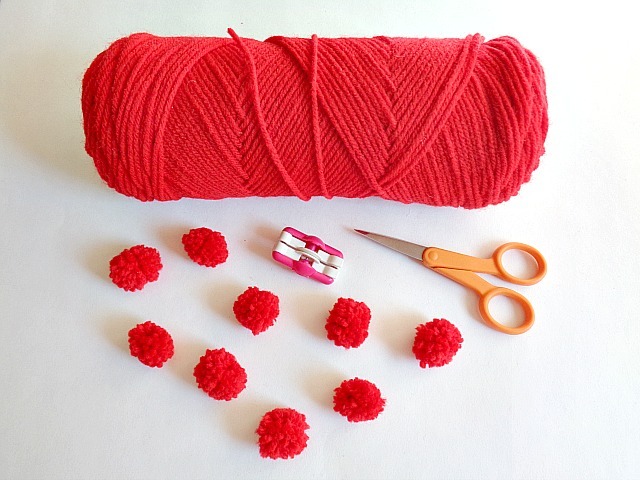 For example, instead of seeing white fabric in between each pom-pom, you will really being seeing ”red fabric” which blends in with your red pom-poms. Step 4: Use your pom-pom maker, create enough pom-poms to cover your entire heart shape. For my heart I ended up making about 63 pom-poms. Now I know that seems alike a lot, but I was using an extra small pom-pom maker. So depending on the size of your heart and the size of your pom-pom maker, you may need to make more or less pom-poms. Step 5: Grab your pom-poms and glue each one within the shape of your heart. Once you’re happy with the look of your pom-pom heart, set your pillow aside to dry. When your pom-pom heart pillow is completely dry, you’re ready to display it! Don’t you just love the combination of pom-poms and pillows? I know I certainly do! You may have noticed that I added a pom-pom to each corner of my pillow. This little touch is completely optional, but I think it pulls the entire pillow together quite nicely. 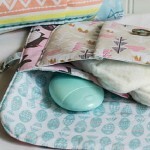 If you what to add this little touch as well, simply make four extra pom-poms and sew them to each corner of your pillow. Also, if you’re still on the fence about sewing your own pillow, you could always buy a pillow or revamp a pillow you already have on hand. Then you could come back to this tutorial and start at step 3 in order to make this project. Are you a fan of pom-poms and pillows? 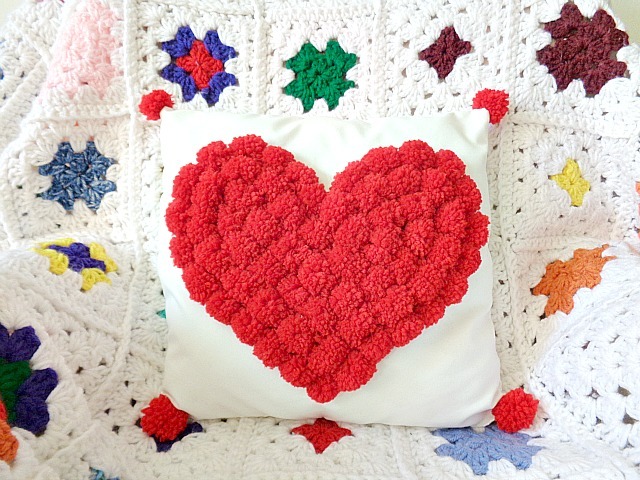 If you made this pillow, what color would you make the pom-pom heart? i loved the look of the pillow. but my eye caught the atention of the background throw. curious to know how u made that. is it crochet?